Without the new cash that would have come in if voters approved a ballot measure to increase hotel taxes, the City Council will be forced to make a painful decision to shutter the tents or again shuffle city funds to keep them open. The implosion of a November ballot measure that could have delivered more money for homeless programs has solidified the uncertain future of tents now serving as temporary homes for hundreds of homeless San Diegans. Without the new cash that might have come in, the City Council will be forced to make a painful decision to shutter the tents or again shuffle city funds to keep them open. Over the past year, San Diego Housing Commission officials have agreed to spend millions of dollars on the three so-called temporary bridge shelters. To do so, they raided their reserves and other accounts meant to support permanent housing projects. Council members raised flags about those decisions and later, the shelters’ failure to meet goals for moving people who lived in the shelters into permanent homes. Nonetheless, they voted to fund them. But there was never a plan to pay for the shelters in Barrio Logan, Midway and East Village beyond next summer. The proposed hotel tax increase pushed by Mayor Kevin Faulconer and a coalition that included the leaders of the nonprofit groups operating the tents had offered an escape valve. The coalition never publicly discussed how it would spend the new homeless funding generated by the tax increase. It said city leaders, not the campaign, would make those decisions. An internal draft plan produced by the mayor’s team in May shows the mayor’s office considered using some of that money to keep the tents open after their current funding was set to run out. 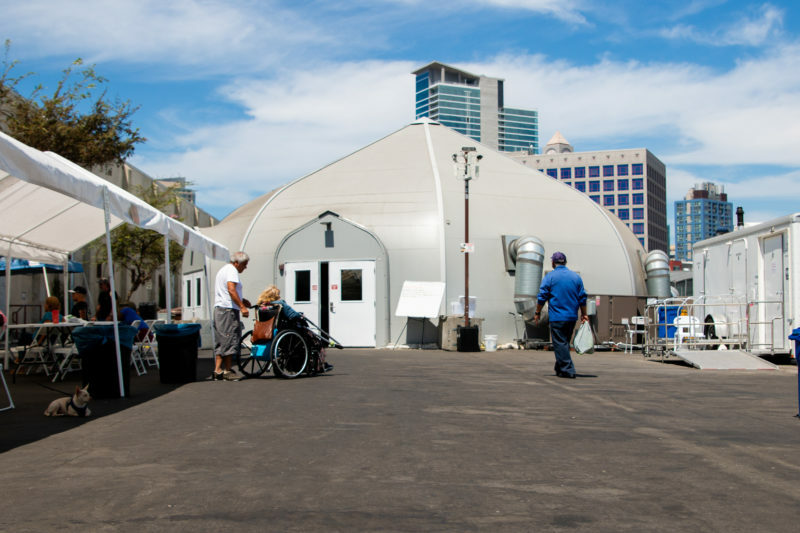 The draft plan, obtained by Voice of San Diego this week, contemplated spending between $32 million and $52 million – out of the $140 million the tax was expected to generate for homelessness over the next five years – to keep the tents open. The document notes that relying on the hotel-tax money would “preserve the availability” of Housing Commission reserves to support new permanent housing projects needed to house homeless San Diegans. In other words, spending hotel tax funds to keep the tents open would free up the Housing Commission to spend its money on its foremost mission: delivering permanent housing opportunities for low-income San Diegans. For the same reason, the plan also suggested using the new cash for two to four homeless storage centers rather than rely on Housing Commission money, which is now supporting the city’s new Sherman Heights storage center. Faulconer spokesman Greg Block said the draft plan was meant to inform discussions with partners on future spending options, and was far from final. The hotel-tax campaign led by business and labor leaders said it did not work on the draft plan. The group earlier this year committed to let the mayor and City Council decide how to spend the new cash if the initiative passed. The campaign’s failure to turn in enough valid signatures to be placed on the November ballot ensured voters are unlikely to weigh in for another two years – if an ongoing signature count reveals the initiative has qualified. Now, barring a special election, the city’s unlikely to get substantial new cash to pay for the tents by next summer, when the City Council must decide whether to keep them open. Block and Housing Commission spokesman Scott Marshall said no plans have been set to pay for the tents after this budget year ends. Faulconer remains committed to keeping the shelters open, Block said. That could set the stage for an emotionally wrought City Council vote that could end with hundreds of homeless San Diegans now in shelter tents being sent back onto the streets. Dan Shea, a restaurateur and philanthropist who teamed with Padres general partner Peter Seidler to lobby for and supply two of the three tents, said his group would not fund operations if the City Council votes to close them. Some Democratic Council members have hinted they may not support the tents going forward. They have questioned the city’s decision to pull Housing Commission reserves, and the shelter tents’ struggles to meet the target to move at least 65 percent of clients into permanent housing. Just 12 percent did so through May, an outcome the nonprofits blame on the region’s lack of affordable housing. City Councilwoman Barbara Bry, who chairs the City Council’s budget committee, suggested at a May City Council meeting that the city consider asking a consultant hired to review the shelters to also work on a wind-down plan for them. “I will support the motion today but going forward I think we really need to decide, and we need your help in looking at, what is the best way we can spend our limited money, in terms of really helping people for the long term,” Bry said before voting to extend contracts with homeless service providers for three months. City Councilman Chris Ward, who represents the downtown area most impacted by homelessness, has backed the mayor’s decision to open the tents but has not committed to funding them over the long haul. The housing-first model, championed for years by the federal government, calls for homeless people to be quickly linked with permanent housing rather spending months or years receiving other services first. Supporters of the tents have argued the new shelters were needed amid a deadly hepatitis A outbreak and the region’s inability to immediately deliver permanent housing. Shea said the tents have connected hundreds of homeless San Diegans who might have languished for years on the street with medical care and other resources. He criticized Bry and others who have argued the tents’ lagging outcomes may make continuing to fund them untenable, and said unrealistic housing targets advocated by City Council members, including Bry, were the problem. Veterans Village of San Diego CEO Kim Mitchell and Alpha Project CEO Bob McElroy, whose nonprofits operate two of the tents, say they worry what will happen to their homeless clients if the shelters close. “If there’s no funding, then we have a lot of homeless people who really have no other place to go,” said Mitchell, whose tent in Midway serves up to 200 homeless veterans a night. McElroy said some of the clients in the Barrio Logan tent grow fearful each time the City Council discusses the tents. Father Joe’s Villages, which operates the third tent in East Village, has said it plans to eventually pursue a housing project at the site of its tent and may be forced to close its tent as soon as mid-2019. The City Council is set to vote next month on updated contracts with Alpha Project, Father Joe’s Villages and Veterans Village of San Diego. Those contracts are expected to extend until next July and were already funded in this year’s budget – yet McElroy still fears a showdown. McElroy and other homeless nonprofit CEOs had publicly supported the hotel-tax campaign in hopes of winning consistent funding available for housing and homeless services, including the tents.